We're halfway down St.Peter's Lane now, and beginning to see the newer houses that were built recently. On the right here is the Adult Education centre, and there's a footpath through to the Marlowe Theatre. 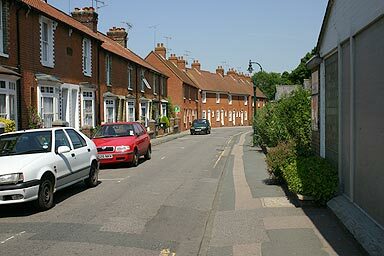 In 1993 and 1994, the Trust undertook a large excavation on the site at the end of the terrace of houses here, the site is now under the nearer of the houses with the redder brick.